We are back in Venice for part two of my mother and my trip for her 60th birthday celebrations. If you have read part one you will know that the weather turned horrible for us the first official day we were there and it was there to stay. We had no other choice but to make the most of it and continue with our plans for sightseeing and shopping, come rain or shine. After breakfast that first morning, I had to take a few minutes to vent on my twitter and get over that my vision of sunny Venice was never going to happen. So my mother did what every parent does, she let me have my five minutes of tantrums then told me to “Poncho Up!” both literally and figuratively. 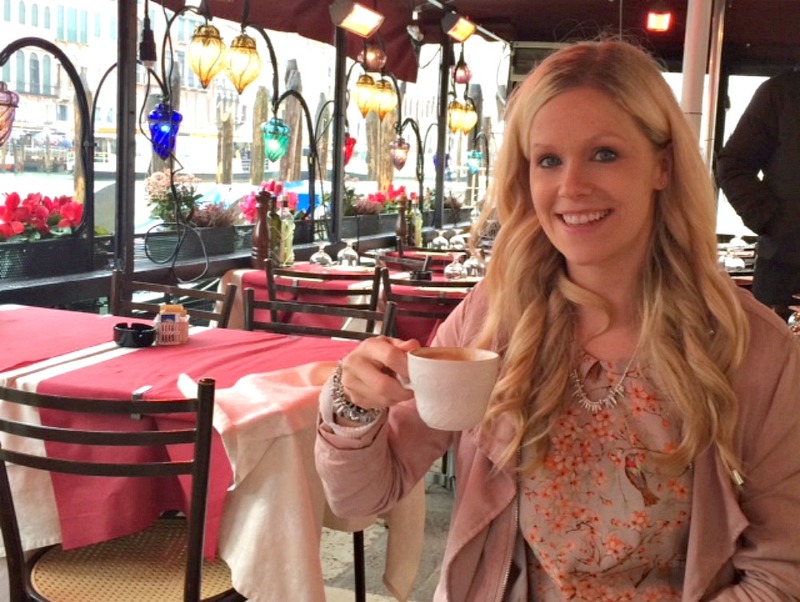 We headed first to the Rialto bridge to check out the little shops and cafes that surround it. 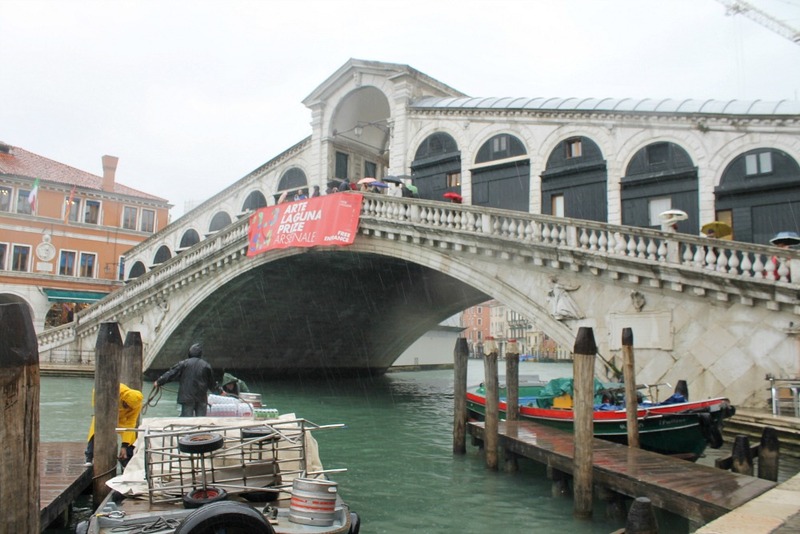 It’s famous for being the first bridge built over the grand canal. I am sure on a hot summer’s day the views are stunning. We pushed our way through hundreds of umbrellas to lean out and take a photo of the grand canal anyways. Above, you can even see the rain coming down it was raining that hard. In Venice when it rains it pours and the vendors are prepared for it. They sell ponchos and plastic shoe bags for your feet too! The canal rises very quickly with the rain and it’s not long before you are trucking through the streets soaked to your knees. If you are sightseeing I would highly recommend a poncho, or waterproof windbreaker and wellies. It is NOT fun trying to attempt holding and walking with an umbrella through tiny, tiny streets with hundreds of others holding and walking with umbrellas. We got whacked a few times with them and it’s like moving through a sea of umbrellas everywhere. The positive side is there is so many umbrellas around you, it’s like a covering for you. Once you get wet you don’t really care anymore so we trucked through the city and walked in and out of high designer shops with our crazy colored ponchos on and dripping wet. The locals are used to it and have umbrella stands and covers at every entrance. 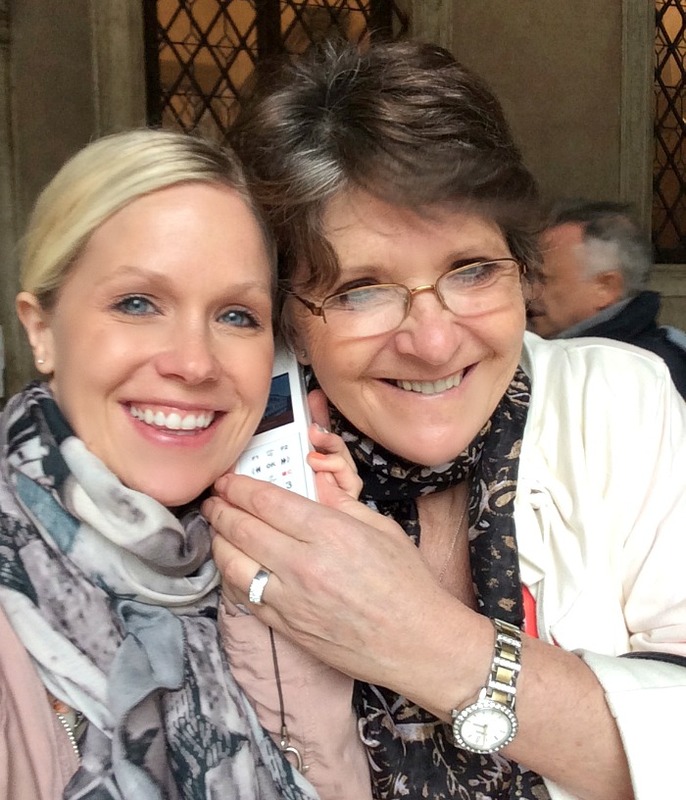 I was a bit nervous to be shopping in Gucci, Prada and Louis Vuitton in a five euro wet poncho but they were never going to see us again, so we did! The shopping was amazing and I was blown away how many shops there were down every single side street. We explored the city and took breaks in coverings when the rain and wind picked up. It was almost nice to give in to mother nature. I was puzzled how the entire city doesn’t flood completely since it’s below sea level and when the water rises you can see in the photo below, it literally is right at the edge of the sidewalk. Here it is almost just pouring over near my feet! I would be so petrified to bring my children here and them be so very close to the water. There is never any gates or side rails to prevent jumping in. Although for adults it makes it lovely to walk along the grand canal watching the boats and gondolas go by. I could have people watched from this point, all day. The coffee was amazing. I loved how the entire canal is full mini cafes and places to eat right on the water. Literally on the other side of these lights and flowers is the edge of the water. 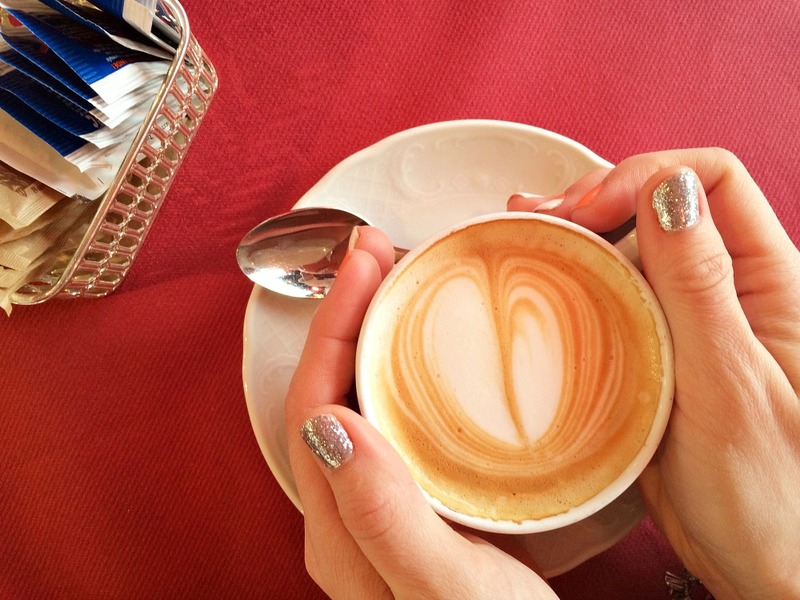 We sat underneath warm heaters from above and sipped hot frothy coffee that was just delicious. I think I could live off the coffee there, so rich and creamy! After stuffing our faces with (amazing) pizza like you do in Italy for lunch, we headed on the other side of Venice to Doge’s Palace. There is a tower, and a few museums connected to the Palace and the prison. We used our rainy day up seeing art and viewing the old prison cells underneath the Palace and the offices of past rich and politic reigns. The building had amazing architecture and detail that a photo doesn’t do it justice. There was gold everywhere and paintings on every wall and ceiling. I love learning about history and going to museums. My mother and I are both the same in this sense so we took our time through each one. I wish we could have taken more photos in each one but sometimes it’s just best to take it all in and appreciate it all for what it is. Here I am in the square of the Palace where most people are hiding in the corner with umbrellas as the wind and rain pick up. I didn’t care by then we were seeing some amazing views below from the tower and walking through halls of history. We listened away to the history of the people of Venice and how things were built and the way of the Venetian life. It always makes me grateful for the era and life that I lead. As a society we don’t suffer like they used to do (obviously still in some places) but technology really has changed everything. It amazes me how the buildings are made and why we don’t build things like this anymore. For the most part there are a lot of run down old buildings in Venice but the churches and palace are truly something to not take your eyes off of. I could lay on the floors of the museum and just stare at all the ceilings, each one telling various stories. 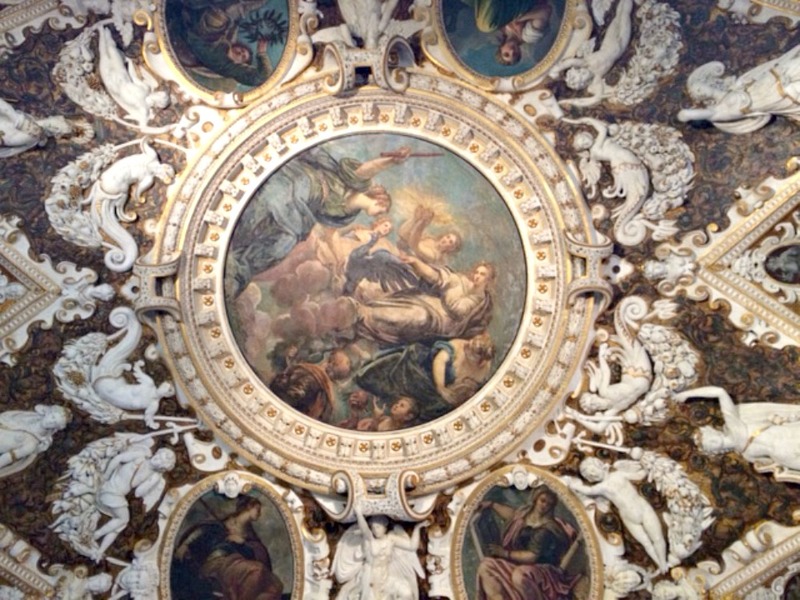 I wonder how the ceilings can even hold such artwork. This is one of the many things I love about traveling around the world, seeing other cultures, the different ways we all lived and went about life. Each one of our worlds has similarities and differences in our histories. It’s amazing that I love it so much now as an adult but hated history class in high school maybe that always comes with maturity. We made the most of our trip with the tourist attractions and trying to stay indoors from the rain. Our ponchos for five euros did us proud in the end. We were watching the weather closely and waiting for our gondola experience to the very last minute. It turns out the rain just wasn’t going to stop. 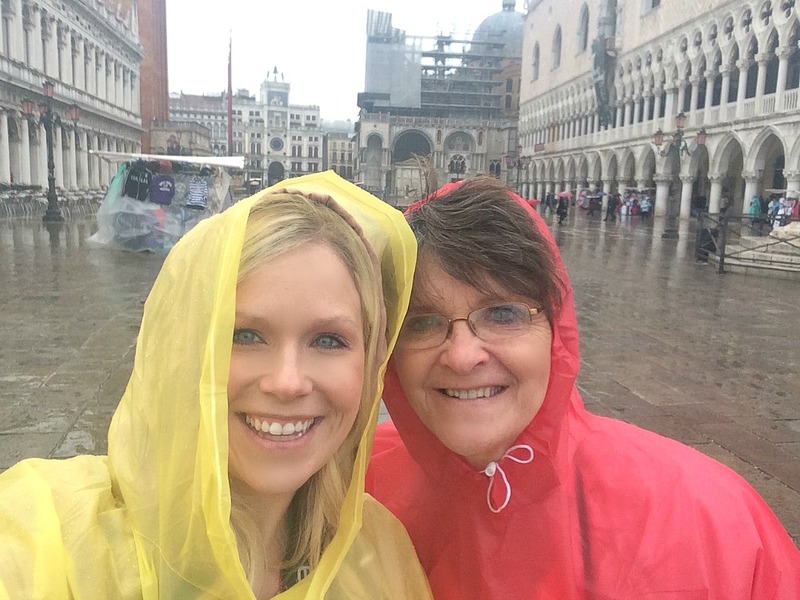 So we preparing ourselves for a very wet but amazing gondola experience so much so I am saving it for my last Venice post because it truly does deserve it’s own post. 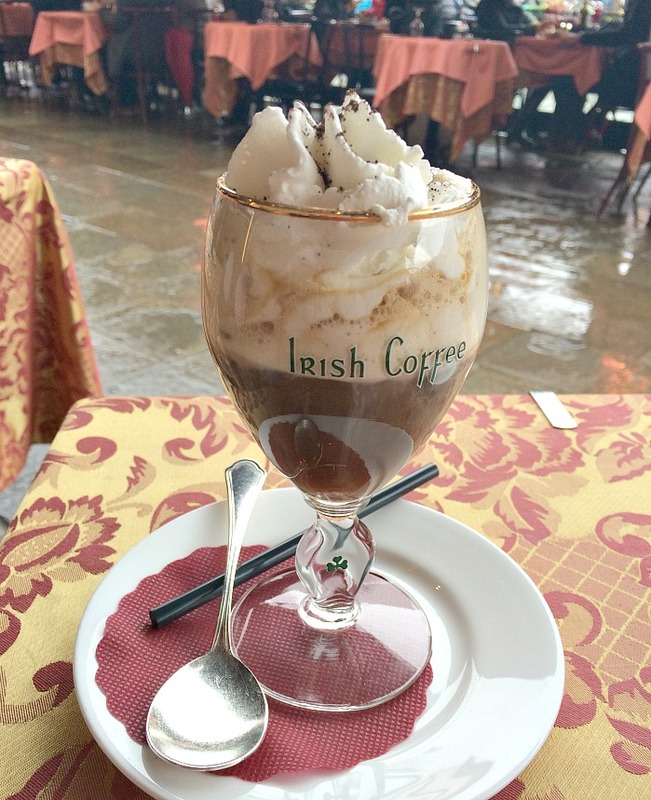 Before we got the courage to get soaked in a gondola, in the canals of Venice, we opted to have a hot ice coffee to warm us from the inside out and maybe a little liquid courage too. It’s one of my favorite moments with my mom sitting there looking out onto the canal and sipping our very alcoholic coffees. We chatted about all the places we wanted to see, and life in general. I love talks like this with my mother. I wish I could have them more often with her. It’s just not the same talking to a computer screen on FaceTime. We had our liquid courage and braved the rough waters of the canal of Venice and survived to tell our tale. We packed our bags to leave rainy Venice, said goodbye to our amazing hotel room, and made our ways through the narrow streets one last time for our watertaxi ride back to the airport. 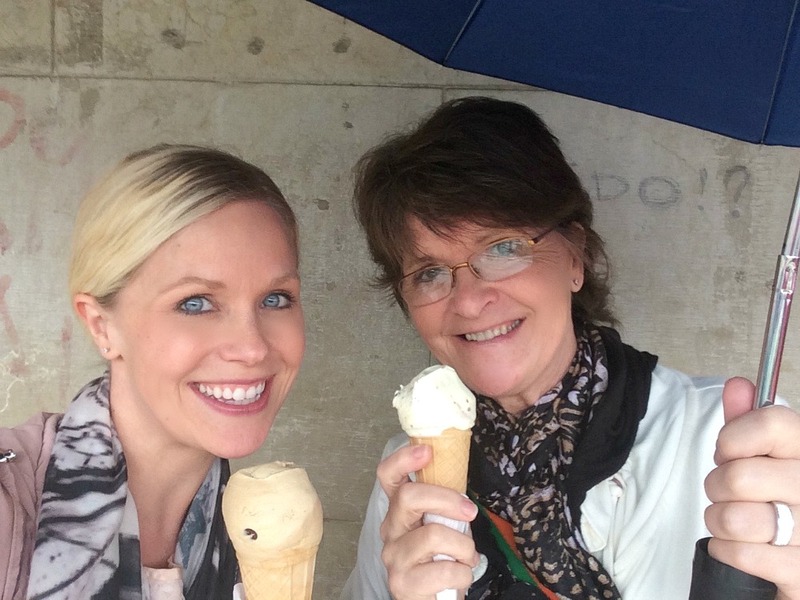 When going to Venice one cannot leave without some “gelato”. We scooped these ones up right in front of our watertaxi stop and it may have been cold and raining but ice cream is the way to my heart and it was a must. So we spent our last hour in Venice hiding under an umbrella on the docks eating ice cream. Laughing about “Ponchoing it up” and our adventures. That’s a holiday to remember, thank you Momma! Sounds like you had an amazing time, Jenny, despite the rain. Gorgeous photographs! Looks like you had a great time despite the rain. Sign that you’re becoming more British – dealing with the (British type) weather. It does look like you had an amazing time, despite the rain. I would love to visit one day and your photos are amazing! I can see that it doesn’t look at all kid-friendly though, like you say, my heart would be in my mouth the entire time I think. Looks like you made the most of it after all 🙂 What a beautiful place and such a great idea to have a holiday with your Mom. Love the photos! Thanks Caro! Glad you liked it. I wish the photos were brighter and better but I did the best I could with what we had. lol I do love some many amazing places in Italy. Thank you Isabella. The rain upset me a bit but I got over it and made the most of it since we were there and had to. We still had fun and made great memories. Despite the weather, you and your mom looked like you had a fabulous time! It’s been a dream of mine to go to Venice and both your posts just confirm how beautiful and wonderful it is! That’s a great experience to have with your mom, and despite the torrential rain, I bet you and her will remember it for a long while. Thanks so much for sharing and for hosting #sharewithme this week! Thank you! It really is a beautiful place and I bet the sunsetting is even moreso! We made the most of it after I tantrumed a little bit. lol But that’s to be expected after all the prep and planning for a perfect getaway. Despite the rain, your pictures are great. I so concur with you on how finding out about historical events and times makes you grateful for the time we live in. I so often think to myself ‘Thank goodness I live in the time and place I do’ when I read of how tough life has been in the past. Thanks for sharing. Thank you. I was a little disappointed that it was dark and rainy. It would have made gorgeous photos raining with some sunshine. lol Me too completely I am so grateful for the era and where I live and how we live now. What a shame it was so wet. Still looked lovely though. Definitely on my list. Amazing pictures even in the rain. What a lovely break and a lovely place. It’s definitely on my list of must-go places, but perhaps without the baby, for risk or drowning! I don’t think the weather matters too much when you haven’t got the children with you, although I can imagine that in Venice, the rise of water level in the street is pretty scary. When we went, it was hot and extremely busy, which spoiled it for me and also, it can be a bit smelly! It’s such a shame that it rained but I love the rain and I think that cities like Venice always looks so beautiful when it’s really wet! You love the rain oh dear me I wish I did coming from Seattle the rainiest city in the states to the UK the rainiest country I am dog tired of the rain following me. lol haha You are lucky to love it. 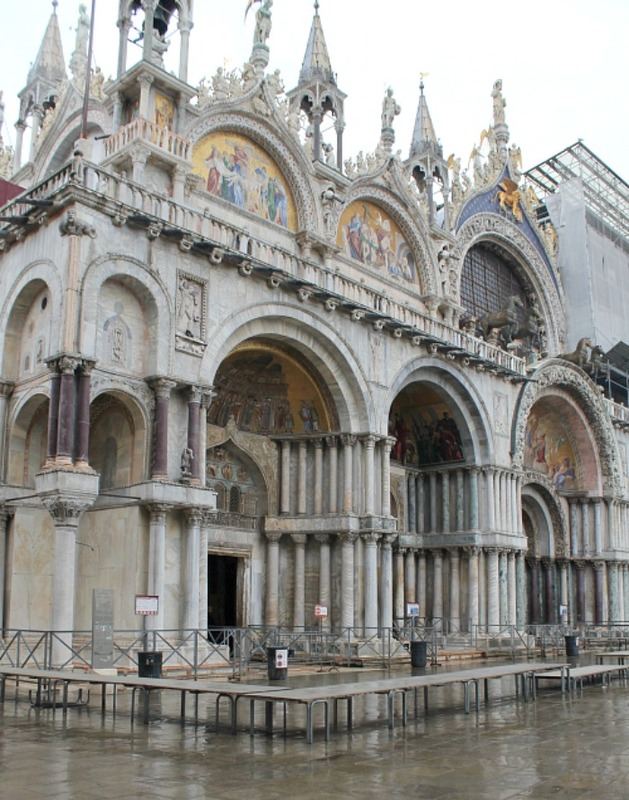 venice was still beautiful in the rain too. This is just the most amazing place to travel with your Mom. Love the architecture too. Thanks for sharing! 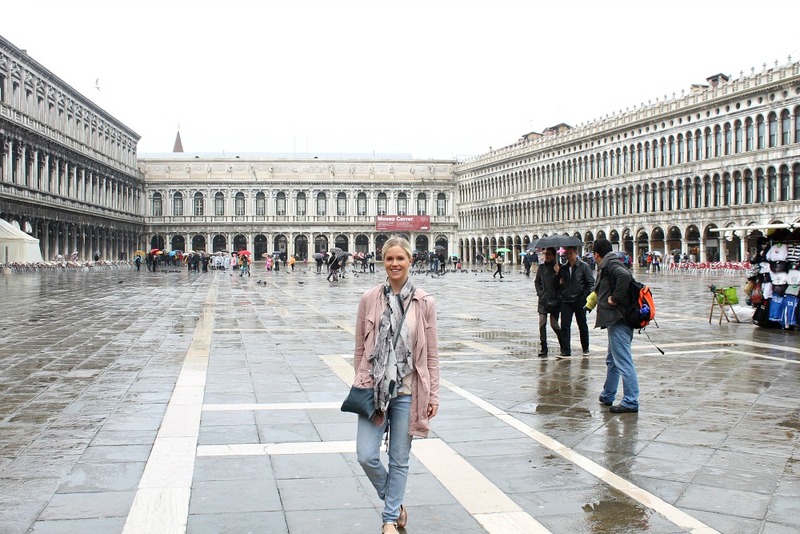 The architecture was mind blowing for sure and I think Venice can be romantic but way better to go with your mom on a shopping, dining girlie weekend! Yes so true and it was nice to have her all to myself and not sharing her with my kids, lets face it when we have kids we lose our parents attention to them for sure. lol We had a good time in spite of the weather. Such a fab, detailed post. I am now dreaming of a trip to Venice…It just looks so beautiful. Thanks Becky. It’s small but a small gem! You should go! I was so upset about the rain it kinda put a little damper on things. Love Venice! Your pictures bring back so many wonderful memories. Glad to be part of your Linky party! Oh thanks she will love to hear that as she always got her sister being mistaken as my mother instead as she is lighter than my mom. lol We still made the most of it for sure. Thanks. Oh yes definitely got to make up for it someday! Might be when the kids are fully grown and it’s just Mr P and I!!! I know me neither. I was slightly worried one night we would all wake up to a major flood and the city sinking. lol Extreme but you had to be there to see how close the water was coming into the hotel!!! I guess the important thing was spending time with your mum, but I can imagine how disappointed you were with the weather. still looks like you had a nice time though. I’m with you on the child safety thing, the local children must be good swimmers! I actually never saw any children not sure where the local children hide! lol It was almost weird not seeing families and children around. lol Oh yes my mother and I left with great memories! Thank you. Thanks Ali. It really was a lovely break to have her all to myself. We always have fun traveling together no matter what. Poncho up is my new mantra! I love it and I want to get it up on the wall for my momma she would love it as art. lol It’s a great saying. Thanks Megan that means a lot as I was a little disappointment in the photos so wasn’t going to share them. Thank you so much Jess. I almost didnt’ share part two because my photos were that great and dark and rainy! I didn’t want to despress everyone. lol Oh yes got to get the tantrum out first and than man up and enjoy it while we could. I am so grateful to be so close to her even though we live so very far apart. Even with the rain it looks like you had an amazing trip with your mother. Gorgeous pictures by the way. Venice is so beautiful. Thanks for the sneak peek! Thank you Yanique! We always have a great time together and make the best of a bad situation. Although being in Venice helped. What a lovely post with great pictures despite the Rain! Your hair looked gorgeous by the way in the cafe 🙂 I went to Venice a few years ago in the summer, it was so beautiful and I’d love to go back one day. What a shame about the weather! 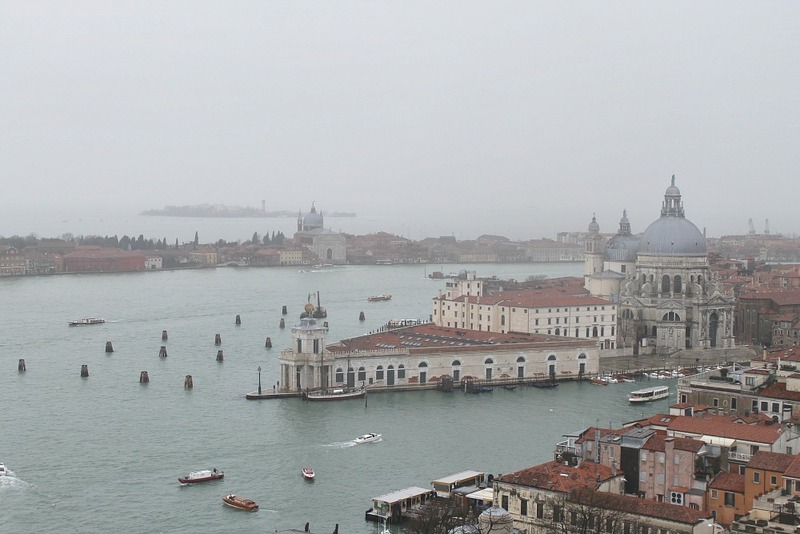 It certainly was a wet Venice! I have never been but you photos make it look lovely…even in the rain and it is certainly on my list of places to visit one day. I can see why you would be scared taking little kids there…the canal is very open isn’t it?! Yes I was shocked how open the canal is and close to the water we were. Never taking small kids there. I would be way too paranoid. Thanks though we had a good trip. Hahaha oh I wouldn’t do that. You might get all our illnesses and rain curses too. Hahah thanks hunny. Thanks hunny. It was lovely to see and explore. Rain didn’t help but we ignored it eventually. No judging we thought they rocked too!!! Thanks. Oh two places I really want to go. No you are so right gelato and pizza win every time. 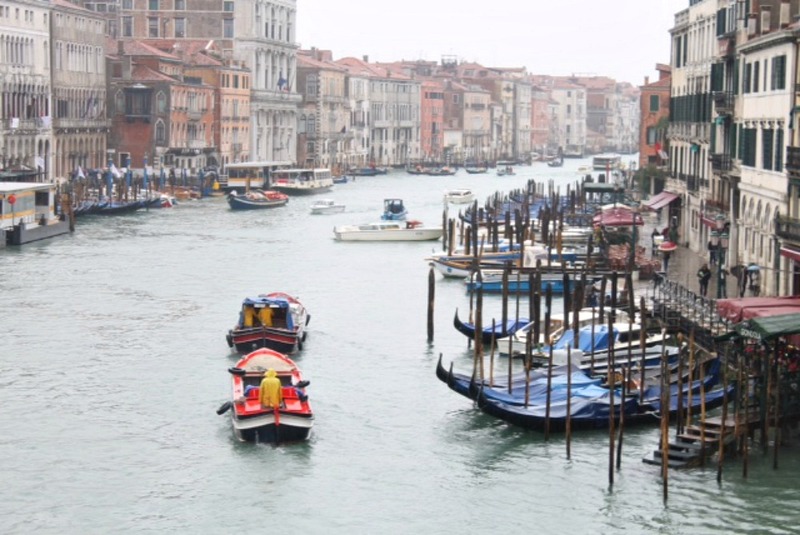 Venice is so beautiful, (even in the rain) I really want to go back there.. Ah the ice cream is amazing. Oh yes I could have ate a bucket of gelato. So scrumptious!!! Venice was a great experience rain or not. We’re hoping to go back to Venice when the kids are a bit older. We went about 15 years ago pre-kids during a cold, wet October and it’s fair to say that the weather put a bit of a downer on our trip. But we will be back! Glad to see you had a good time with your mum. Thanks Zena you are too kind to the poncho!!!! Lol and me!!! I don’t think anyone can pull of a poncho really but we had a good laugh about it. It’s a shame the weather wasn’t great for you, but it looks like you had a fun time with your mum. Your smiles tell it all! I love Italy and I have travelled around a bit, but I haven’t been to Venice yet. It’s still on the bucket list! We made the most of it while we were there for sure. I love mother daughter trips and can’t wait until my daughter is old enough to one day come with us. Three generation trips would be great too. Oh yes it really is a wonderful city and great visit. Wish we had the pleasure of at least one nice sunny day. Hahaha greedy I know. Thanks. Thanks Hun. 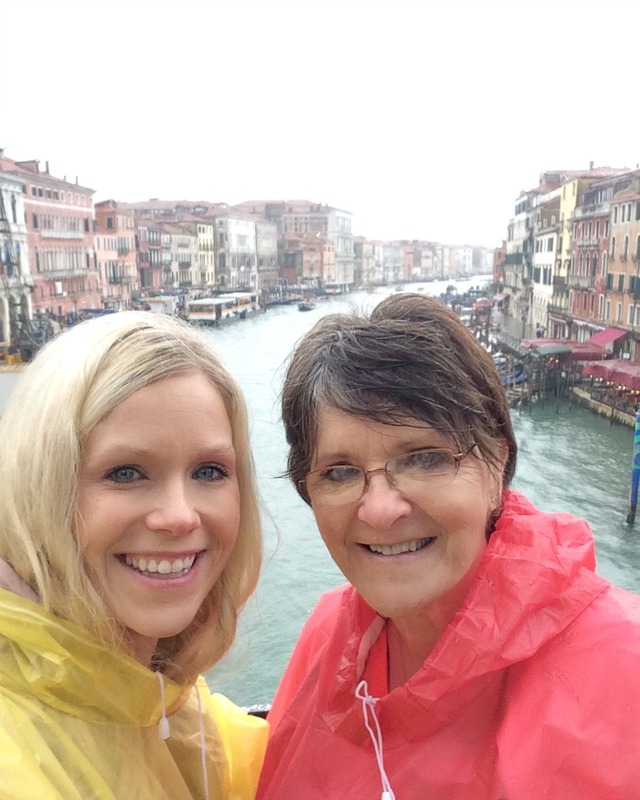 I think Venice is a great place for mom trips! You both should go together. I love time with her too and I just don’t get enough of it.